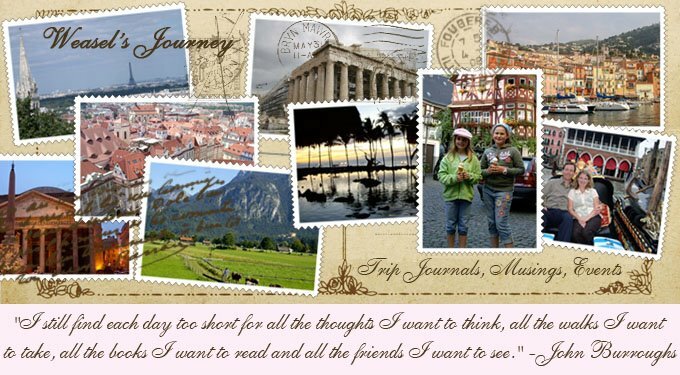 Weasel's Journey: My best brownies. 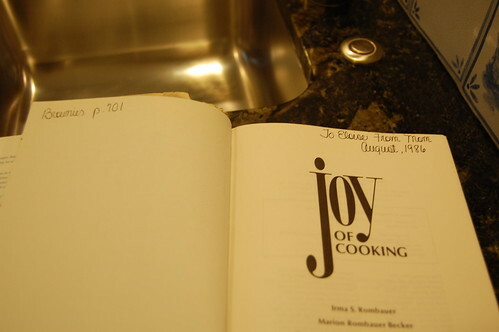 My mom gave me a copy of The Joy of Cooking after I graduated from college and moved into my first apartment. I have used it frequently as a reference over the years, and I love its recipe for Brownies Cockaigne. 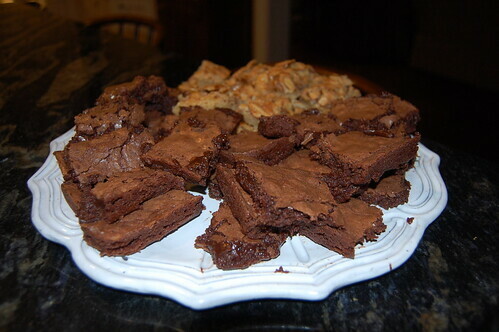 Not only are these brownies deliciously moist and chewy, they are easy to prepare and made from ingredients that I usually have on hand. Melt butter and chocolate in a double boiler (I always do this in the microwave - start at full power for a minute, stir, then cook 30 seconds longer). Let this mixture cool completely or your brownies will be heavy and dry (I don't actually know this for a fact because the warning has always scared me into letting the mixture cool). In a mixer cream together eggs and salt "until light in color and foamy in texture." Add sugar and vanilla gradually and mix until well blended. With a few swift strokes combine the cooled chocolate mixture and the eggs and sugar (the cookbook insists that this part be done by hand, which I do, but it takes me a couple more than a few swift strokes). 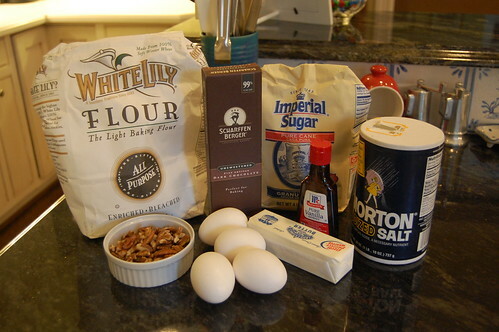 Stir in flour just until blended then add nuts. Pour into a greased and floured 9x13 pan. Bake at 350 for 25-30 minutes (I removed this batch a little too early as I was in a hurry; they're not usually quite this gooey). I hope this means that Hockey Boy is on the mend! My mouth is watering! Thanks for sharing this recipe! I am a real chocoholic so thanks for sharing!